Signature Stamps USA Custom - Stamps Signs Badges. Customized, laser engraved or full color. Design online! 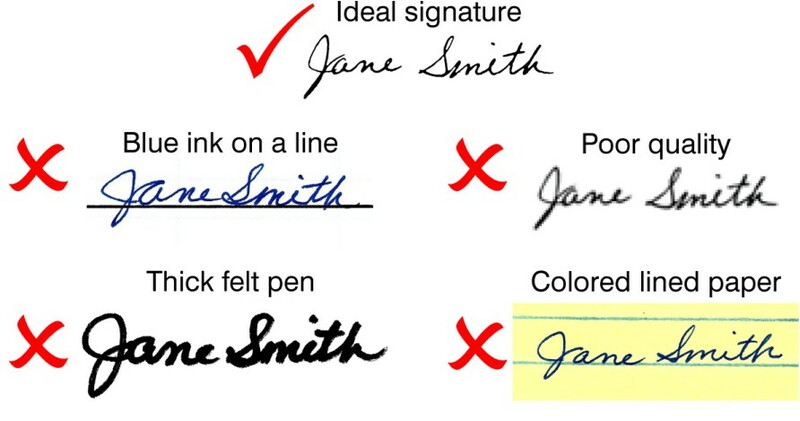 The ideal signature stamp is one that is created from your digital file that is emailed or uploaded to your web order. Scan your signature then email / upload your saved digital image. Generally, JPG files are fine. *Consult your scanner documentation to confirm resolution at 300DPI or greater. 300DPI is standard for many. Make sure to sign your name in black ink, with a crisp, clear pen. Do not sign using felt tip markers, as your signature may appear too thick. Your digital file should be black and white, not color, and no smaller than your desired stamp size with a resolution of at least 300dpi. *Low resolution images do not produce quality signature stamps. Please avoid sending signatures by FAX. The resolution and detail is degraded by the process and, all too often, the size of the FAXED image is unreliable. NOTE the final size desired for your signature. Supply desired size dimensions or other size requirements or note that signature should be used as supplied. *Our standard process, if no other information is present is to size the signature for endorsing a check. However, some circumstances may indicate we leave the signature at the supplied size or reduce to fit the stamp ordered. For best results - Please let us know the size your signature needs to be. Try to avoid large sweeps and try to keep signature "proportional" to desired stamp size for best fit. Generally, the same requirements for signatures apply to any artwork being sent to us for a stamp. Signatures or art are subject to a "clean up fee" if additional work needs to be done by our graphics team to meet the requirements of engraving. AVOID these fees by supplying clean art at required resolution with included sizing information. Our most COMMON Signature Stamps are usually sized for signing the backs of checks or similar and include these popular Self-Inkling models linked below or similar sizes in other styles (CLICK for Full Stamp Selection). Please always send design notes on the desired dimensions of the signature on the stamp so we can create the best example for your needs. *View / Download this information to save or share, including templates for the stamps below!